My first Guided by Voices concert experience occurred at a small local theater in St. Louis during the summer of 1994. Knowing little about the band at the time, I was surprised by the group of peculiarly average-looking guys who graced the stage. Singer Robert Pollard had finally quit his job as a grade-school teacher and was ready to take their catchy rock 'n' roll across the country. His bandmates from Dayton, Ohio, included some local misfits dressed in jeans and sporting beer bellies. Could these guys live up to the hype? Actually, Guided by Voices' shows go well beyond even the best you could expect from these guys. Their 1996 concert in Columbia, Missouri remains one of the fondest memories of my college years. It seemed to draw the true rock fans of all ages for an energetic celebration. Supported by everyone's favorite drinking buddies, the audience chanted along with classic tunes known only to the niche audience. The band blazed along for two-and-a-half hours and reached a plateau rarely attained by a touring act at a small club. Over the past six years, Guided by Voices has evolved into an entirely different lineup (with the exception of frontman Pollard). This version is much better musically and drinks slightly less beer, but they lack the genuine allure of their predecessors. Some of the live songs are the same, and the musicianship is much better, but the overall effect does not match its past glory. 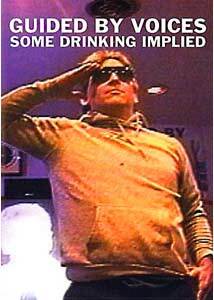 Guided by Voices: Some Drinking Implied recalls those fun younger days of this highly regarded rock band. It showcases some early videos filmed prior to 1994 (arguably their breakout year), and includes an odd collection of rare material. The show begins with a strange prologue from Geo, who originally appeared as the crazy guy from down the street in Guided by Voices: The Who Went Home and Cried. Next, the scene moves to Pete's R-n-R Sausage Party, which offers performance footage from Thomas Jefferson Slave Apartments, another Ohio rock band. Pollard takes the microphone afterwards and stumbles through terrible versions of classic tracks Hot Freaks and Postal Blowfish. This sequence runs for about 12 minutes and becomes awfully tedious, but it exemplifies Pollard's allure. He may not be anywhere near top form, but his unfortunate performance keeps him at the "regular guy" status. Devout fans should enjoy the inclusion of a series of previously unreleased videos from the back catalog. Why Did You Land? is a great rocker that meshes nicely with the simple footage. Also notable is Chief Barrel Belly, which mostly utilizes shots of Pollard, Tobin Sprout, and Mitch Mitchell staring at the camera. It is also enjoyable to watch the video for Weed King, a classic Guided by Voices tune. Less effective is the glaringly amateurish Wild People, a home movie shot by Pollard in high school. In this five-minute short, a young guy wearing a silly mask goes on a murdering spree, and the results are pretty incoherent. Interspersed with the videos and weird interludes are some quick moments of live footage. We witness the guys playing an arena in early 1994 opening for the Afghan Whigs and the Breeders. While they roar through such raucous tracks as My Impression Now and Exit Flagger, the awful sound quality and quick cutting makes appreciating them difficult. It does provide more amusement through the activities of an overly enthusiastic roady. My favorite moment in the entire film concerns a show played at a library. At first the camera remains with the band, and it seems to take place at the usual concert venue. However, the shot quickly moves over to the side, and we see a small group of students dancing like crazy in front of the book stacks. Their reckless, energetic abandon reveals the continued allure of Guided by Voices�fun, rock 'n' roll with hooks guaranteed to stir an exuberant frenzy. Image Transfer Review: The only saving grace of this awful visual transfer is that the images generally stem from poor home-video footage. At certain points, the picture becomes extremely cloudy and out-of-focus, which makes viewing especially frustrating. Given the low-budget atmosphere of the entire release, the awful visuals are more understandable, but they remain irritating during numerous moments. Audio Transfer Review: Again, the sound quality varies considerably between each item due the different technical levels. On an overall scale, this disc fails miserably to offer a clear presentation. The videos are okay, but the live footage is extremely poor. I would imagine there have to be enough decent recordings of the band to replace the lesser footage. Extras Review: Some Drinking Implied contains only 18 chapter cues and a very simple menu. I discovered one frustrating problem: if you pause the feature and proceed to the menu, you cannot return to the same place without choosing the appropriate chapter. Highlighting the main film will start you at the beginning again. Guided by Voices: Some Drinking Implied will probably only work for the devout fans who want to see every side of the band. It is doubtful to draw too many new members into the growing flock. Curious readers would be advised to listen to Bee Thousand, Alien Lanes, or Isolation Drills for an introduction. If you become an ardent follower, then it might be time to check out this uneven release.